The night sky, sprinkled with twinkling stars and the pale light of a silvery Moon, has fascinated humans since the dawn of history. But, why is it dark? If you think that the answer is: "Because you don't see the Sun," think again. While it's true that we need the Sun not to be there, its absence is definitely not sufficient, as the following example demonstrates. Imagine that you are standing in the middle of a forest where all the tree trunks are painted white. If the forest is endless, you would see around you a uniformly white, continuous background, since a tree trunk would eventually interrupt every possible line of sight. Similarly, if the universe were infinite, and filled identical stars, the night sky would glare with the brightness of the surface of a star. Instead, we see huge gaps of darkness separating the stars. Why is that? This puzzle has become known as "Olbers' paradox," named after the German physician and astronomer Wilhelm Olbers, who discussed it in 1823. This attribution is rather unfortunate, however, since Olbers was neither the first to ask this question, nor were his suggestions for how to solve it particularly valuable. Astronomer Edward Harrison extensively researched the history of this riddle, and he described his findings in the interesting book Darkness at Night. The first person to record his wonder about the dark night sky was probably the Copernican astronomer Thomas Digges, who in 1576 suggested that the solution to the paradox lies in the fact that most stars could not be seen because "the greatest part rest by reason of their wonderful distance invisible unto us." Unfortunately, while Digges seems to have understood that there was a problem, his proposed solution does not hold water. Take a universe that is uniformly filled with identical stars, and imagine that we divide space around the Earth into equally spaced thin spherical shells of increasing radius. A spherical shell that has twice the radius of another, contains four times as many stars (because its surface area is four times larger). Thus, even though each star in the more distant shell would indeed appear four times dimmer (the brightness decreases as the inverse square of the distance), the total light received from it would be the same as the total light received from the closer-in shell. The next person to have been puzzled by the night's darkness was the famous astronomer Johannes Kepler, who in 1610 wrote (in a letter to Galileo) that in an infinite universe filled with stars (Figure 1), "the whole celestial vault would be as luminous as the Sun." Kepler's proposed solution to the paradox -- the universe has to be finite. This fell in line with Kepler's religious beliefs that the entire universe was "for man's sake." Figure 1. 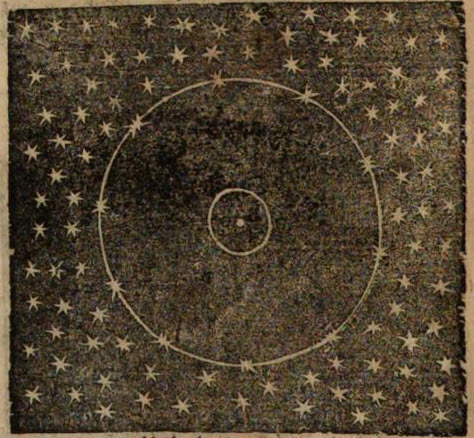 A figure from Kepler's "Epitome of Copernican Astronomy." It shows how the universe is filled with stars, surrounding the solar system (from: tychogirl). Edmund Halley (after whom Halley's comet is named) also tried his hand at explaining the nocturnal darkness in 1720, but unfortunately his explanation was precisely the same as Digges's, so it failed for the same reason. "Were the succession of stars endless, then the background of the sky would present us a uniform luminosity, like that displayed by the Galaxy -- since there could be absolutely no point, in all that background, at which would not exist a star. The only mode, therefore, in which, under such a state of affairs, we could comprehend the voids which our telescopes find in innumerable directions, would be by supposing the distance of the invisible background so immense that no ray from it has yet been able to reach us at all." In other words, Poe suggested that the universe has a finite age and therefore, because the speed of light is also finite, our observable universe has a horizon beyond which we don't see stars. Poe's qualitative solution was put onto solid mathematical ground in 1901, when physicist Lord Kelvin rigorously showed that in a universe that has a finite age, or one in which stars shine during a certain finite lifetime, the night's sky should be dark. Today we know that, in addition to the universe's finite age, the cosmic expansion also contributes to the night sky's darkness. Because of the fact that the universe expands, the energy of all the emitted radiation (including the background radiation -- the "afterglow" of the Big Bang) has been reduced (redshifted) down to the low temperature of the cosmic microwave background (about 2.7 Kelvin; Figure 2). Figure 2. 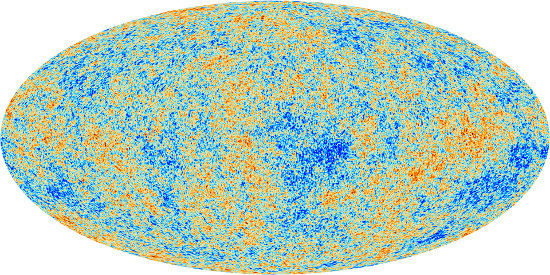 The Cosmic Microwave Background as observed by the Planck Satellite. Credit: ESA and the Planck Collaboration. Amazingly, the simple fact that the night's sky is dark finds its explanation in the Big Bang theory -- our universe is expanding and it has a finite age of about 13.8 billion years.